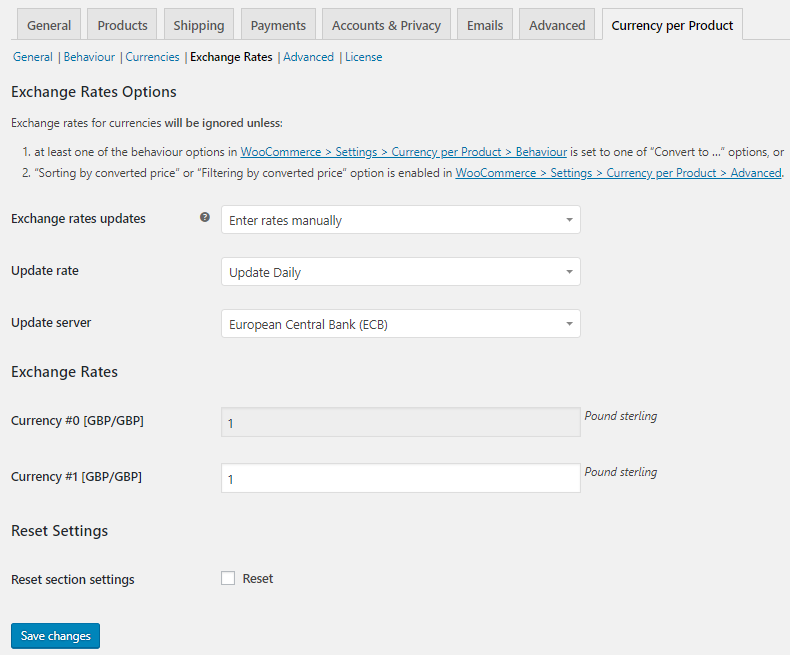 The Behaviour settings of Currency per Product for WooCommerce Pro plugin helps you to set and display product prices in different currencies on shop, cart and checkout pages. Sometimes you need to show converted prices as per the selected currency on these pages. Therefore we need to use the Exchange rates settings to show converted product prices on your online store. There are 3 Exchange rate options which together helps you to set the exchange rate updates automatically. There are 2 ways in which you can update the exchange rates – Automatically and Manually. When you select Update rates automatically option and click the Save changes button, Update rates now button will appear. You can click on this button to update the exchange rates automatically. This exchange rates update will take place automatically depending upon the Update rate option set. You can select to update the exchange rates manually by clicking the Enter rates manually option from the Exchange rates updates dropdown. When you do so, you will be able to add an exchange rate for the currency manually under the Exchange Rates section. The default option for this setting is Enter rates manually. This setting lets you select how often currency exchange rates should be updated. When you set Exchange rates updates option to Update rates automatically, Update rate options will be applicable. There are 3 options under Update rate dropdown. You can choose to update the exchange rates daily, hourly, or twice daily. If you select Update Daily option, the exchange rates update will take place at the same time everyday. Similarly, when you select option Update Hourly, the exchange rate will automatically update every hour and when you select Update Twice Daily, update will take place twice in a day. There is an indication of the number of hours remaining until the next update under the Exchange rates updates dropdown. The default option for Update rate setting is Update Daily. It allows you to select a server for updating the currency exchange rates. There are 3 servers to select from the Update server dropdown – European Central Bank, TCMB, Free Currency Converter API (free.currencyconverterapi.com). By default the server selected is European Central Bank. This section allows you to enter exchange rates manually for all currencies listed. All currencies that you add on Currencies settings page will appear under Exchange Rates section. This part will be effective when you select Enter rates manually option for Exchange rates updates setting. Remember that Exchange rate options will only be applicable if one of the options under Behaviour settings page is set to Convert to shop default currency option or if you enable the Sorting by converted price or Filtering by converted price option on Advanced Settings page. This setting allows you to reset the Exchange Rates Options and Exchange Rates section to its default value. 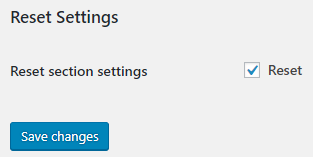 For this, click on the Reset checkbox of Reset section settings and click the Save changes button. This will reset the Exchange rates updates to Enter rates manually option, Update rate to Update Daily option and Update server to European Central Bank (ECB). In the Exchange Rates section, the base currency and additional currencies added under Currencies settings page will appear with the value 1 set for all currencies.